The edge of the head is secured into an exterior groove, which is then covered with a colored knit cord. This design minimizes the tendency of the head to pull away from the shell. 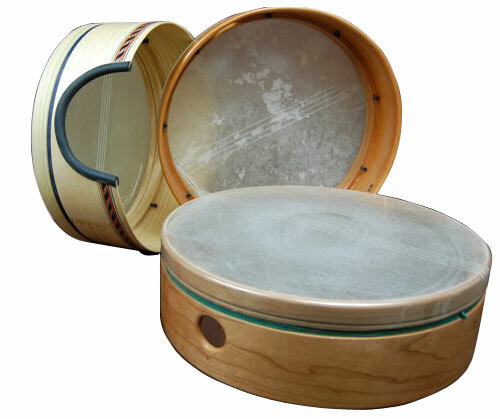 These drums are available with a goatskin head or a REMO¯ ® synthetic head. Our patented internal tuning technology preserves the traditional appearance of the instrument and allows the player to maintain a complete range of motion, unencumbered by external hardware. Tension on the head is adjusted by the action of an internal, lightweight, moveable bearing member. A T-grip Allen wrench and tuning instructions are included. A smoothly rolled 1 ¼” thumb hole is strategically placed so that the drum is well balanced and comfortable in your hands. A hand rubbed, natural finish accentuates the inherent beauty of the wood.